Even with transparency the IRS fails to address reported fraud. When the IRS DOESN’T cross reference information that was submitted to the Social Security Administration, they leave the door open for nonprofits to cook the books. This is done when a Nonprofit reports paying wages to (ghost) employees, but they don’t file federal tax forms to report employment taxes for those employees. This was exposed in an article from The Chronicle of Higher Education, titled ” IRS Steps Up Scrutiny of Colleges and Other Nonprofit Groups” dated 12/20/10. Ghost employees are usually real people who have no idea that their names are being used on a nonprofits 990 form. 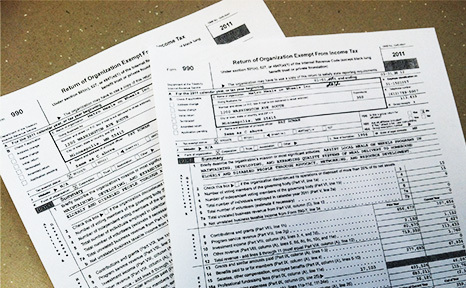 If you work for a nonprofit and you suspect fraud, then you should check out their 990 form. ” If you see something, say something,” but don’t expect the IRS to do anything when you do! Thanks to CitizenAudit.org for posting more than three years of a nonprofits 990 forms for free. What we don’t know can hurt us!